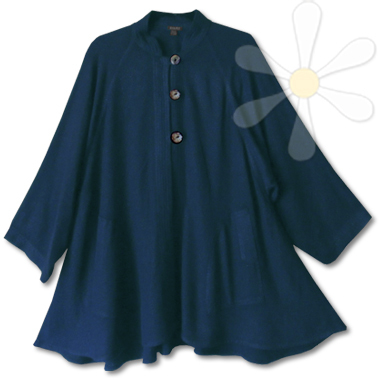 This wonderful style is cut to a graceful A-line and features three large polished shell buttons with loop closures. All the banded hems are trapunto-stitched in neat rows, including the functional BIG front pockets. Wider at the bottom, it's especially designed for those of us a bit curvier at the hips and features deep comfy raglan sleeves. We think of it as easy classic comfort!